Following the announcement of the discovery of Proxima b, the Red Dots campaign aims at detecting additional small planetary sized companions to Proxima Centauri. But we already have hints of variability in the star’s radial velocities not explained by the presence of Proxima b alone. There is more to the star than Proxima b. We explained in our paper last year1 that there was evidence for variability at a period of roughly 215 days in the radial velocity data from two instruments: HARPS (including the Pale Red Dot observing run in 2016) at ESO observatory at La Silla, ESO’s UVES instrument at VLT in Paranal, Chile. 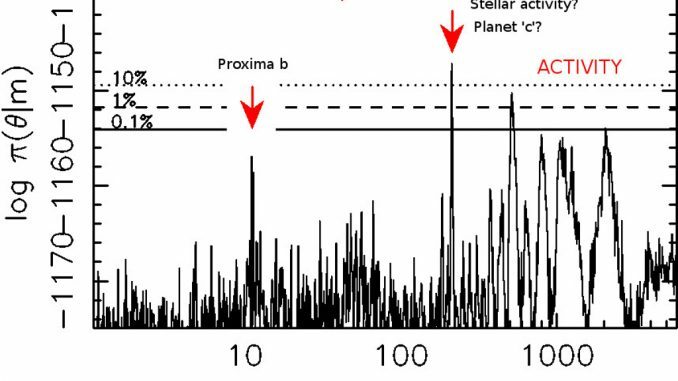 This variability is much more dominant on these relatively longer periods than the signal caused by Proxima b and is especially clearly visible when looking at the unbinned data (Fig. 1) — it is certainly amplified with respect to that in the nightly binned data presented in the Proxima b discovery paper. But although we labelled this variability as activity and removed it in order to study the signal of Proxima b at a shorter period, in reality, we do not know its origin. Different hypotheses range from instrumental instability to activity of the stellar surface to Doppler signature of another planet orbiting the star. Fig. 1. Probability distribution as a function of signal period indicating the periods corresponding to signals most probably present in the data. The nature of the prominent signals with periods above ~100 days is unclear and could be due to the star’s activity. In contrast, we do not see any indications of periodic behaviour at or near the rotation period of the star of some 83 days in the radial velocity data (Fig. 1). This is good news because it indicates that our observations and data analysis techniques are likely not contaminated by spurious signals caused by the star’s rotation, clearly identified in our All Sky Automated Survey brightness observations of the star. Could some other unknown cycles of the stellar surface, such as magnetic cycles, contribute to the observed period of 215 days? This is certainly plausible but we have not been able to observe the star with high enough cadence for a long enough period of time to enable giving this cycle a unique explanation. This might not be possible with the Red Dots campaign either, but continuously monitoring the star for a period of roughly half of this cycle could help resolving its origin. We hypothesise that if it is indeed caused by star’s activity, our photometric monitoring campaign will reveal similar variability in the star’s brightness. However, lacking such a confirmation will strengthen the alternative hypothesis that the period of 215 days could be caused by planet ‘c’, a cold super-Earth with a minimum mass of some 3.3 times the mass of Earth, orbiting Proxima Centauri. We know that red dwarf stars such as Proxima Centauri have, on average, at least 2.5 planets orbiting them.2 This suggests that Proxima b is not alone in the system either. 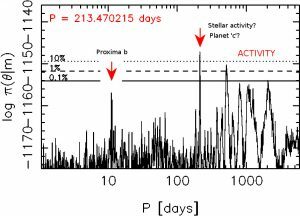 Although verifying the planetary nature of the periodic signals on longer periods in Proxima Centauri’s radial velocities will not be easy and might well be beyond our Red Dots campaign, we will be able to estimate constraints for small planets on short periods. Should Earth-sized planets be orbiting Proxima Centauri on orbits with periods below some 50-100 days, we should be able to identify their signals. Alternatively, we will be able to rule them out and conclude that Proxima b has no close-in siblings in the system. Either way, we will have learned something new about the planetary real estate in the Solar neighbourhood. Anglada-Escudé G. et al. “A Terrestrial Candidate in a Temperate Orbit Around Proxima Centauri”, Nature, 536, 437 (2016). Dressing, C. D. & Charbonneau, D. “The Occurrence of Potentially Habitable Planets Orbiting M Dwarfs Estimated from the Full Kepler Dataset and an Empirical Measurement of the Detection Sensitivity”, The Astrophysical Journal, 807, 45 (2015). Astronomer at @UniofHerts studying exoplanets and worrying about our own. Discoverer of the nearest exoplanet #Proximab. We believe we have evidence that Proxima b is inhabited by a space mobile sentient species known as the Cenos aliens. This, along with a unusual planet formation theory, suggest that it’s host star, Proxima Centauri, may have a brown dwarf star companion. Any effort to find this elusive body would be appreciated. There is a modest possibility that this brown dwarf star would have an orbital inclination of about 45 degrees to the orbital plane of Proxima b. Almost 60 years ago, an account emerged of aliens from a planet around Proxima Centauri. It’s been largely forgotten, but now that we know the planet is real, does the wild story deserve another look? Um companheiro para Proxima b?